With the Spring weather well and truly rolling in this past weekend it instantly got me thinking of the fragrances as I tend to switch up the types of fragrances that I wear depending on the season. I thought i’d share with you the fragrances i’m currently loving, of which I would recommend to anyone who hasn’t tried them before. For anyone who knows me, I love my floral scented fragrances and have ever since I had my first bottle of Vera Wang Princess but my taste does evolve and change as I get older. Recently i’ve added a few new fragrances into my collection, and i’ve also been pulling a few old favourites from the last few summers that i’ve wearing non stop recently. One fragrance that i’ve banged on about far too much is YSL Black Opium (£85), and rightly so because it’s an absolutely beautifully scented fragrance that deserves the hype and love that it gets. This fragrance is definitely one i’d describe as a womanly and more grown up version of the fragrances that I loved when I was younger, as it has a sexiness and seductiveness about it that I just love, and I get so many compliments on this scent whenever I wear it! Another fragrance that i’ve spoken a lot about recently has been the Giorgio Armani Si (£69), which I treated myself to on my Australia trip and is one i’ve wanted for such a long time as a fair few of my friends wear this scent, and I absolutely adore it. This again is a more grown up version of the scents I loved when I was younger, with fruity notes that have a seductive yet still feminine feel to it. I also love this fragrance for packaging as it’s simple yet elegant, and suits the perfume down to a t.
Finally we have a fragrance that I added into my collection a couple of years ago after longing for it for a few years. This is the Estee Lauder Bronze Goddess Perfume, which is actually a limited edition scent that they bring out each year and this essentially smells like a holiday in a bottle! I typically save this fragrance to wear during the summer months as it doesn’t work that well for me during the colder months, and it means that it lasts so much longer than the fragrances I wear all year round! 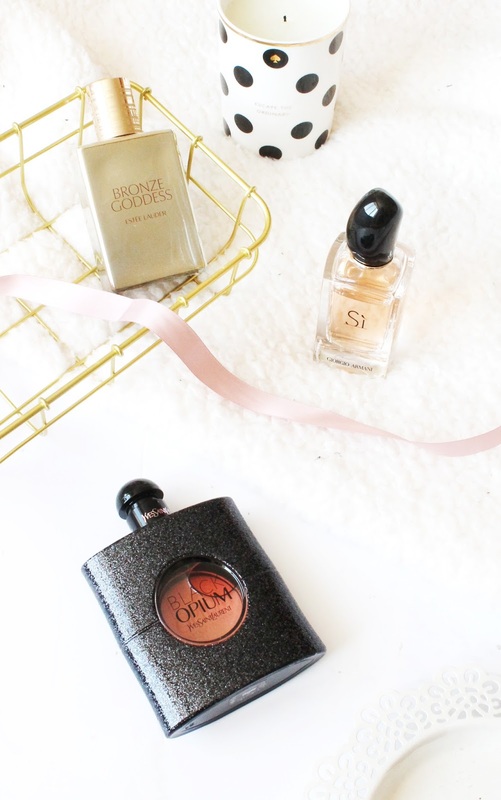 So those are the fragrances that i’m currently loving for Spring! What are you favourite fragrances?